Arctic Grayling are one of Alaska’s most delicate and beautiful sport fish. Their identification is easy due to their vibrant colors and incredibly large dorsal fin. The Arctic Grayling’s coloration varies greatly, and in larger Grayling that can grow up to 24 inches, their bold colors are truly a sight to see. The prominent dorsal fin is usually fringed in red and has enormous, iridescent splotches of red, aqua, or purple. Their backs are usually dark and their sides range from black or blue to silver or gold. Arctic Grayling have white bellies with gold borders and pelvic fins with luminous orange, red, or pink stripes. They also have gold eyes and their bodies are larger and thicker than other Alaska fish like salmon, trout, or char. Arctic Grayling are the only species of Grayling fish found in North America. They are freshwater fish, dwelling in rivers and streams throughout Alaska. They have the largest natural range of any sport fish in Alaska and can be found across almost the entire state except for Southeast Alaska, the Aleutians and Kodiak Island. Many grayling migrate, moving from stream to stream to complete different stages of their life such as spawning, maturation and summer feeding. There are some, however, who complete their entire life cycle in a single stream or lake. Some of those who do migrate upstream for spawning and summer feeding return to the same areas each year. Arctic Grayling can live up to 32 years and can weigh up to five pounds fully matured. A single river system can be home to a wide array of differently sized Arctic Grayling, although there is usually a pattern in the distribution of sizes. Older, larger adults are commonly found in the upper reaches of a river where the water is cooler, while younger fish stay towards the middle. The juvenile Grayling live in the warmer waters of the river’s lower reaches. According to the Alaska Department of Fish and Game, some mountainous states, such as Arizona and California, stock Arctic Grayling in their lakes, though they do not naturally occur there. At one time, their abundance stretched as far south as Michigan. Their almost complete disappearance from the Lower 48 States was caused by over fishing, competition from non-native species and loss of habitat. Thankfully, this colorful fish still graces nearly all of Alaska’s wild freshwaters. The incredible beauty of the Arctic Grayling makes this fish a highly popular and well sought after pursuit for anglers. 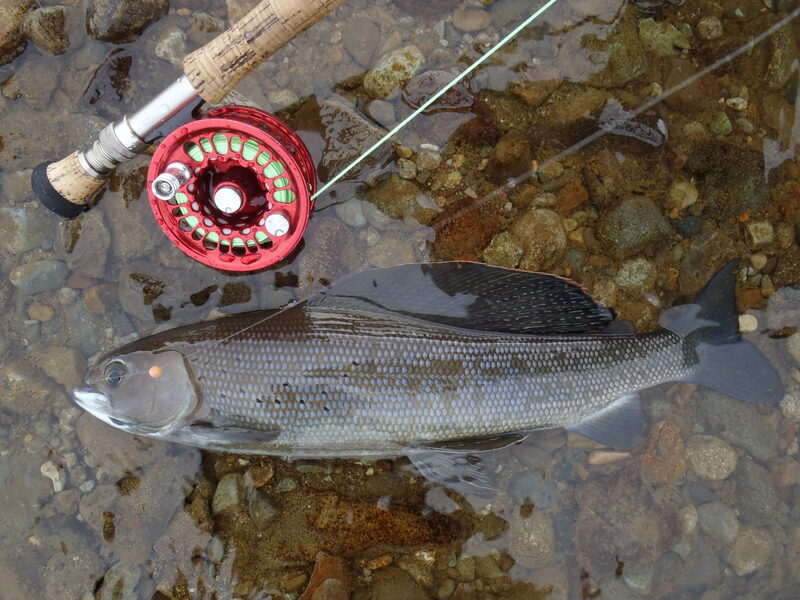 Arctic Grayling can be fished year round, although they spend much of their time under the ice without feeding. Therefore, peak season in Alaska begins the first week of June, when the fish are beginning to move inland for spawning. After spawning, Arctic Grayling must feed actively throughout the summer to replenish their nutrients in preparation for the winter when they don’t feed as much, so peak fishing season goes well into September. Because the Arctic Grayling’s range extends throughout most of Alaska, you’ll have plenty of options for exploring new, exciting and scenic locations. The fact that they migrate often throughout their life cycle makes them consistently plentiful throughout Alaskan waters. They are in perpetual motion, yet they are freshwater fish, which keeps them towards the rivers and streams. Though relatively small, Arctic Grayling are very fast and they are aggressive eaters. They are eager to swim to the surface in search of food and this is why they are thought to be an ideal fish for beginners just learning how to fish. 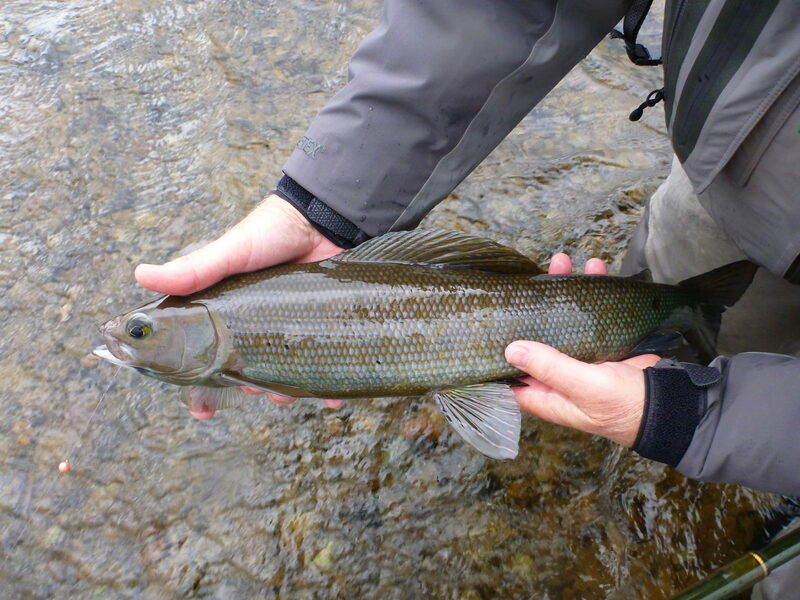 More than just beautiful fish, Grayling will put up a fight; so don’t be deceived by their size. A five-weight rod is recommended for catching them. Arctic Grayling are great top water feeders. During the warm days of their active feeding season, they move to the surface in search of food and are likely to investigate anything floating on the water’s surface. While they have been known to eat small rodents or birds, their preferred diet primarily consists of insects and salmon eggs. In particular, they gravitate towards mayflies, caddis flies and stoneflies. Given that Arctic Grayling are prone to readily eat things floating on the surface of the water, they are rather easy for fly fishermen to at least spot. Dry flies, streamers and nymphs are the ideal way to catch them. Casting your fly so that it rests lightly on the surface is all you need to do and the Grayling are likely to come investigating. Just don’t forget: they put up a fight! Arctic Grayling are top feeders and during the warm days of the summer, are easily spotted near the surface. Cooler evenings during the late summer and into the fall find these fish staying further below the surface. There isn’t much activity past the Arctic Grayling’s main feeding season beginning in June and going into September. While they are still present beyond this period, you’ll see much more action during the summer. Dry flies, nymphs and streamers to imitate their natural diet of insects are the surest ways to attract and catch Grayling. Choose your rod appropriately depending on where in the stream you will be fishing. If you’re fishing upstream with the older and stronger fish, choose a heavier rod. Arctic Grayling are aggressive and your rod needs to match their weight.